Astonishingly, there are millions of people in the world today who retain remnants of Jewish traditions after as long as 500 years, but are often completely unaware of their Jewish origins. They are descendants of those Jews who were forced to convert to Christianity mostly during the period 1391-1492 in Spain and during the mass forced-conversion during 1497 in Portugal. They were known as conversos or New Christians or pejoratively as “marranos.” In Hebrew they are known as Anousim (coerced) and their contemporary descendants are known as Bnei Anousim. The reason 1391 is a significant date is in that year a wave of anti-Semitism swept Spain that included violent attacks on Jewish communities all over Spain, resulting not only in thousands of Jews murdered, but also in forced conversions throughout Spain. From then on it was customary throughout Spain for Jews to be forcibly converted to Christianity. The edict of expulsion that was promulgated in 1492 in the Alhambra by King Ferdinand and Queen Isabella of Castile applied only to those who had remained Jews and continued to practice Judaism. They were given three months to sell off all their property and houses and they had to leave with only what they could carry. They were exiled from Spain (Sefarad in Hebrew) and they became the Jewish group known as Sefardim. The intention of the Edict was to rid Spain of the Jews who might still influence those who had been converted to Christianity. The ca. 200,000 Jews who were expelled from Spain in 1492 divided into two main groups of Sefardim, those that spread around the Mediterranean (including N. Africa, Italy, and Turkey) and those that moved to the nearby country of Portugal. King John II of Portugal was at that time prepared to allow them to stay there for a limited period of time. The ca. 120,000 Jews that entered Portugal after 1492, constituted ca. 10% of the total Portuguese population at that time. But, the King soon died and his successor King Emmanuel I, decided that he would follow the Spanish example, so in 1497 he forced all the Jews to convert to Christianity. After that date there were officially no more Jews in Portugal. In 1506 there was a major massacre of conversos (”Jews”) in Lisbon that murdered ca. 3,000. For the ca. 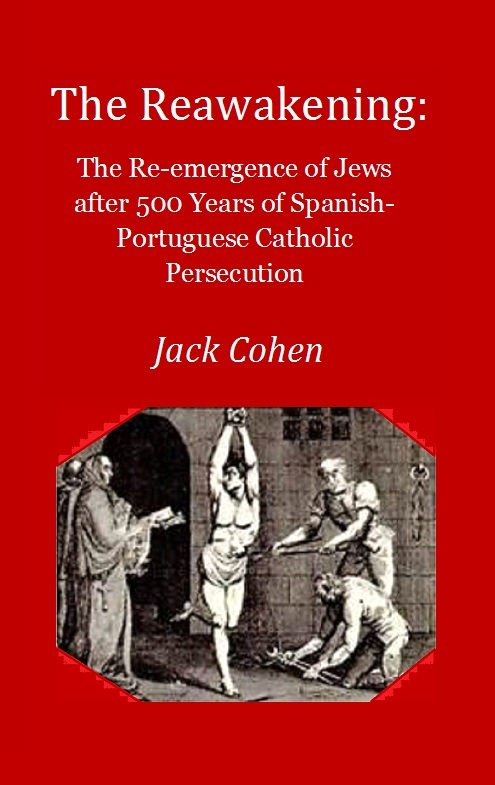 300,000 New Christians left in Spain after 1492 and the entire population of Jews that had been converted in Portugal, it was forbidden to own Hebrew books, such as the Bible, discuss Judaism, or meet in groups to pray. There were no synagogues, no Jewish institutions and appearing to celebrate the Sabbath (on Saturday) in any way was banned and dangerous. The “Holy Office” of the Inquisition, the Tribunal for the Doctrine of the Faith, that functioned in Spain from 1478–1834 and in Portugal from 1536, was established to ensure that the New Christians were indeed true Christians and to rid Spain of any remaining heretics. Many of the descendants of the conversos fled Spain and Portugal to Central and South America and elsewhere throughout the Spanish/Portuguese world to escape the depredations of the brutal Inquisition. Many of these New Christians may have been sincere believers. But it was the practice of the Inquisition that if anyone was arrested on suspicion of judaizing, a capital offence of which they were assumed to be guilty. Note that although the Inquisition was a religious body, its function was basically racial, it was obsessed with the “limpieza de sangre” the purity of blood of the Christians, and so it went after New Christians as if they were all loyal to the “Law of Moses.” They were routinely imprisoned, tortured and all their possessions were confiscated (divided between the Church and the Crown) and their whole extended family was also arrested (somewhat like the Nazi-era Gestapo). Thousands of innocent people died in this way. An estimate of the number of people officially executed during the 16th-17th centuries by the Spanish Inquisition (including its colonies) for judaizing, usually by burning at the stake (auto-da fe), is no less than 4,397. Note the irony that Jesus Christ, whom the Inquisitors supposedly believed in, was of course a Jew, born a Jew and practiced Judaism throughout his life. It should be emphasized that descendants of the conversos or New Christians are to be found everywhere in the world, from Miami to Goa, from Holland to New Zealand. But here I only refer to a small number of discrete Crypto-Jewish communities that have a specific interest related to the history of the Crypto-Jews themselves. Also, while there are certainly hundreds of individuals who have through persistent genealogical research re-embraced their Judaic roots, nevertheless the number of individual personal stories that could be told or retold here is of course limited.